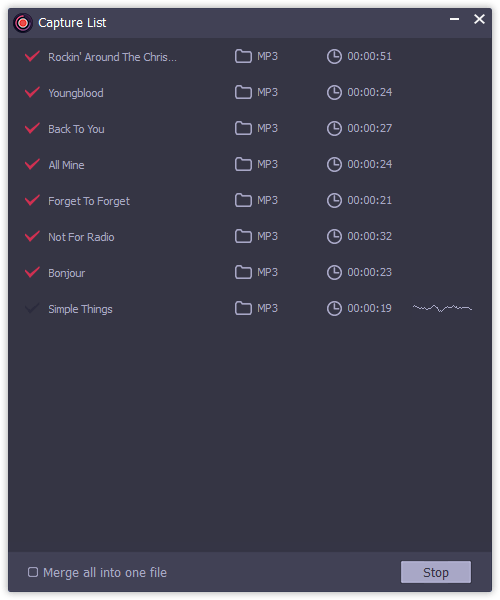 AudFree Audio Capture is designed to record all types of audio tracks from browsers like Chrome, Internet Explorer, or the popular streaming music sites like Spotify, Apple Music, Deezer, iTunes, or local media players, like VLC, Windows Media Player, or your video sharing sites, like YouTube, Vimeo, Dailymotion, etc. With built-in audio editing function, AudFree Audio Capture for Windows allows you to define output format as MP3, WAV, AAC and FLAC, split, cut or merge the recorded audio clips, and customize audio output quality, like audio codec, bit rate, sample rate, etc. according to your own needs. It is also capable of preserving the lossless quality and original ID3 tags in audio recordings. Key Features of AudFree Audio Capture for Windows: 1. Record any sound you hear from your PC losslessly; 2. Capture streaming music, online radios, background music, in-game sound, etc; 3. Save audio recordings as MP3, FLAC, WAV, AAC, M4B and M4A; 4. Split, cut, and merge recorded audio tracks as you like; 5. Grab multiple audio tracks simultaneously with ID3 tags kept; 6. Play DRM-ed streaming music on almost all devices and players. Changes: 1. Fixed the problem of program crash when opening Chrome for capturing; 2. Supports for the latest Tidal version; 3. Solved the issue that output files couldn't be saved due to containing illegal characters; 4. Optimized the display of history records. Users can only use the software for personal use. Any commercial use are not encouraged.